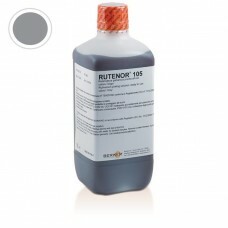 RUTENOR 105 GRAY COLOR RUTHENIUM SOLUTION BATHRUTENOR 105 is a bath ruthenium capable of depositing a layer of pure ruthenium (maximum 0.2 micron) resistant to abrasion in titanium gray. This acidic process is mainly used in electroplating for decorative titanium-colored applications with high co..
RUTENOR 200RA BLACK COLOR RUTHENIUM SOLUTION BATH Black additive for RUTENOR 205C extra black ruthenium processes. 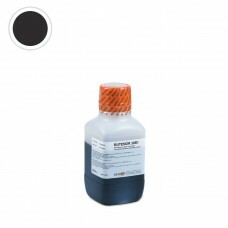 Metal / Type Ruteniature Precious metal - Color Black Use Bathroom ..
RUTENOR 205C EXTRA BLACK COLOR RUTHENIUM SOLUTION BATHRUTENOR 205C is a ruthenium for bath that is able to deposit a layer of pure extra-black ruthenium. This acidic process is mainly used in electroplating for decorative applications where a nickel-free extra-black finish is required. 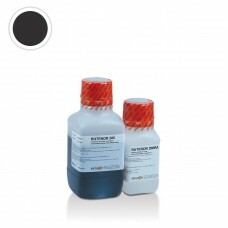 Thanks to ..
RUTENOR 305C DARK GRAY COLOR RUTHENIUM SOLUTION BATHRUTENOR 305C is a bath ruthenium capable of depositing a layer of pure ruthenium in dark gray gunmetal color. 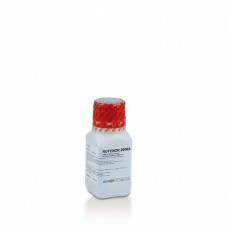 This acidic process is mainly used in electroplating for decorative applications where a dark gray nickel-free gunmetal gray finish is ..
RUTENOR HD / HDX HARDENING ADDITIVEBlack and gun-metal grey ruthenium coats have the disadvantage of not being very resistant to abrasion and consequently they get damaged quickly. 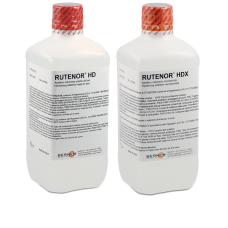 RUTENOR HD is an innovative chemical process developed at Berkem laboratories that’s able to harden and consolidate..